One homer wasn't enough for Seth Brown on Monday night. Neither was two. 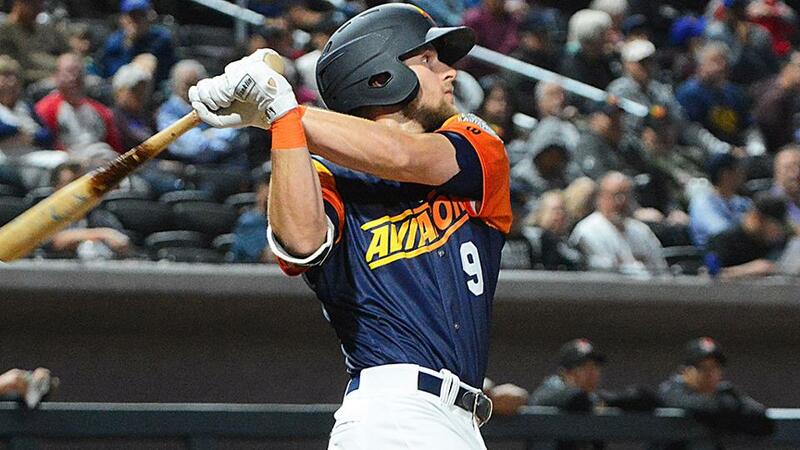 The Oakland first-base prospect went deep three times in Triple-A Las Vegas' 7-6 win over Fresno at Las Vegas Ballpark, driving in a season-high six runs in his first professional three-homer game. Brown's feat was accomplished during his first three trips to the plate. It was difficult for him to put his emotions into words after the game. "I don't think it has sunk in yet," he said. "It was just super special. I can't even describe the feeling of it. Like I said, it's pretty unreal to be a part of. I just feel lucky." The first blast came on just the second pitch he saw from Nationals No. 30 prospect Kyle McGowin, a hanging changeup he sent out to right-center field in the first inning. The 26-year-old homered again his next time up in the third to tie the game when McGowin left another offspeed pitch up in the zone, driving it out to right. His third time facing McGowin, Brown quickly deduced the right-hander wouldn't make the mistake of throwing him the off-speed again. He worked a six-pitch at-bat before connecting on a solo shot to right-center that gave the Aviators the lead in the fifth. "I figured it out about the second pitch into my third at-bat that he was done throwing off-speed to me, so he kept throwing fastballs away," the 26-year-old said. "I kept hunting, just trying to get something out over the plate that I could handle. One snuck in a little bit, and I was able to get a good barrel on it and that one carried out for me too." It not only was Brown's first three-homer affair in the Minors, it was his first such performance of his entire life, dating "all the way back to Little League." "It's been one of the best games I think I've ever played," he said. The trifecta marked the second three-homer game in Pacific Coast League play this season. Round Rock's Yordan Alvarez also accomplished the feat on April 6 against New Orleans. Brown belted 14 homers and drove in 90 runs at Double-A Midland last season after delivering 30 long balls and 109 RBIs for Class A Advanced Stockton in 2017. To begin the 2019 season, he's batting .382 with four homers and 15 RBIs. Las Vegas is 10-2 on the year, sitting them firmly atop the Pacific Coast League. So while Brown may be off to a tremendous start, the fact that the Aviators are flying high as a whole really has him in the clouds. "Every time you show up to the yard, it's exciting," he said. "You can feel the excitement, even just relaxing in the locker room. I'm surrounded by a group of great guys and a phenomenal coaching staff. So it's exciting to be a part of. ... I feel blessed to be able to come here every day."